Turkish Prime Minister Ahmet Davutoglu said Saturday that his country’s efforts to deter Syrians from entering Greece by sea had drastically cut daily migrant voyages from 6,000 in November to as few as 130 since early April. 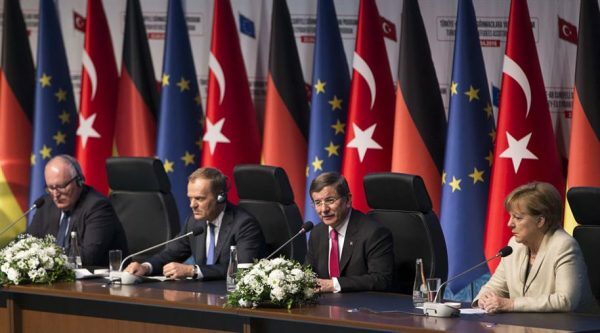 Davutoglu spoke from the Turkish city of Gaziantep near the Syrian border, alongside German Chancellor Angela Merkel and European Council President Donald Tusk. Merkel and Tusk were seeking to enforce terms of a deal under which migrants arriving in Greece would be returned to Turkey, in exchange for nearly $7 billion in European aid. Davutoglu also sought to dispel accusations from humanitarian organizations that the Turkish crackdown had forced Syrian migrants fleeing war to return home against their will. “There was not a single refugee that was sent back from Turkey into Syria against their will,” he said. For his part, Tusk described Turkey as “the best example for the whole world of how we should treat refugees,” and said no one has the right to “lecture” the Ankara government on how it has handled the refugee situation. Tusk also said the immediate monetary value of European aid would exceed $1 billion in the coming months. On Friday, Amnesty International urged members of the European delegation not to “close their eyes to the catalog of human rights abuses faced by refugees” in Turkey. Amnesty’s comments followed a recent European Parliament report that criticized Turkey’s record on human rights and media freedom in 2015. That report urged the country to improve its human rights record, and said Ankara’s bid to join the 28-nation EU trade bloc would succeed or fail based on how it met those EU demands.